After Illinois lawmakers patted themselves on the back and told taxpayers the budget they passed this year was balanced, a bond issuance tells potential buyers that the state budget is $1.2 billion in the red. Even using the proceeds of a $5 billion income tax increase passed in 2017, and assurances from lawmakers it was balanced when they passed it in May, a state filing for bond buyers notes that the "Fiscal Year 2019 General Funds budget has an estimated underlying structural deficit of $1.2 billion." The governor's office said the two series of bonds, one a $656.5 million issuance that matures in 2033, and a second for $263.7 million that matures in 2032, is not borrowing, it's swapping interest rates that are variable with fixed interest rates. That rate is not yet known. Illinois' credit rating, which is the worst in the country at one notch above junk status, could affect that interest rate, possibly costing taxpayers more. The state would start paying $44.4 million in 2020, then around $100 million in 2021, and even more the following year, with varying principal amounts to be paid back until maturity, the document shows. The governor's office said the $1.2 billion structural deficit is actually for future budget years because those budgets won't include things like, for example, the sale of the Thompson Center in Chicago, if it were actually sold this year. After it was passed hours before deadline in May, a number of watchdog groups raised concerns about the budget's rosy assumptions and the gimmicks used to make it appear balanced. The budget passed with widespread support. Lawmakers had put the money from the estimated sale price of the Thompson Center in previous budgets, but the government-owned building was never sold. Truth In Accounting Research Director Bill Bergman took issue with the term "structural deficit." "The risk is that when you use the term ‘structural deficit' to refer to something that can't go away, well maybe it can if you refer to the structure and not just the taxes," Bergman said. Policy makers have to begin to rethink how government services are delivered and at what level, Bergman said. While he said TIA doesn't advocate one way or the other, an example of changing the structure would be increasing privatization of services in public education. The $1 billion bond issuance is meant to pay for the pension buyout plans lawmakers passed as part of the budget. Lawmakers have said the savings could be more than $400 million. But the plans are optional. Bergman said the fact it's a voluntary program means these are projections, not results. "You can't take projections as being very valuable," he said. S&P Global Ratings said in June the plan doesn't guarantee taxpayer savings. "The state would finance the buyouts with proceeds from the issuance of up to $1 billion in bonds authorized by the payout legislation," S&P's report said. "This follows a familiar pattern in which lawmakers favor the immediate recognition of any potential savings related to pension policy changes while deferring those that result in higher costs." Gov. Bruce Rauner said the deficit will take work to balance. 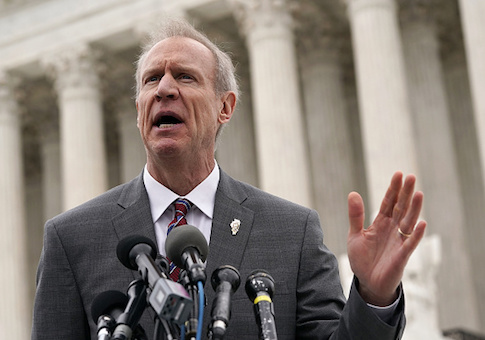 "It needs to be managed, it's not just automatic," Rauner, who signed the budget, said. "You can't just be on autopilot, and be balanced. It's not balanced on autopilot, it's balanced with hard management by us." The governor on Tuesday said there needs to be spending cuts and more economic growth to address the state's troubled finances. The bond issuance document said to "avoid future structural deficits, the Governor and General Assembly would, among other potential solutions, need to reduce expenditures, adjust revenue collections or approve a combination of revenue adjustments and reduction in expenditures. The state provides no assurances as to how, when or in what form this structural deficit might be addressed." State Rep. Robert Martwick, who voted for the budget, said it's better than not having one. He said the reported deficit is a sign of bad things to come and that things will get worse if the state doesn't change to a progressive income tax system where income is taxed at higher rates for those who earn more money. "So doing what we're doing, which is ignoring our problems and not addressing them, is putting Illinois on a path of higher and higher taxes," said Martwhick, D-Chicago. State Rep. David McSweeney, R-Barrington Hills, voted against the budget. He said Illinois needs to cut spending. Raising taxes would be a disaster, he said. Instead, he said the answer is pension reform, Medicaid reform, cuts in spending and slashing taxes and regulations. State Rep. Barbara Wheeler, who also voted against the budget, said the Democrat-controlled legislature passed a budget with a tax increase and without reforms on spending. "So without reforms, the balloon just keeps on getting bigger," said Wheeler, R-Crystal Lake. Wheeler said the state should focus on getting more revenue from economic growth, not increasing taxes.